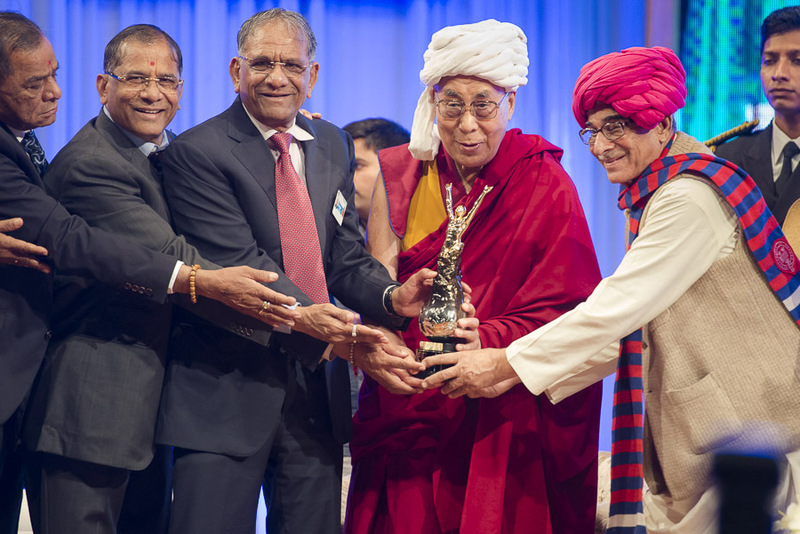 (TibetanReview.net, Jan03, 2015) – Tibet’s exiled spiritual leader, the Dalai Lama, on Jan 2 received a peace award, a donation, and a diamond studded trophy in the diamond city of Surat in the Indian state of Gujarat. He was in the city as a guest of diamond entrepreneur Govind Dholakia of the SRK Foundation. He was presented the Santokbaa Manavratna Award, which was instituted in 2007 by the SRK Foundation. “We are happy that Dalai Lama has agreed to accept the award. He has contributed immensely towards world peace,” the timesofindia.indiatimes.com Dec 29 quoted Dholakia as saying. Dholakia had left this village at the age of 13, began as a diamond cutter and eventually founded his own company. The Dalai Lama paid a goodwill visit to the Ramkrishna Export diamond factory. Previous winners of the award have included Dr Sam Pitroda, Dr Vergese Kurian, Dr HL Trivedi, Narayan Desai, Poornima Pakwasa and Dr MS Swaminathan. Apart from the Santokbaa award, the Dalai Lama was to receive a Rs. 2.5 million donation and a diamond studded trophy in presence of Kanjibhai Balala (President, Saurashtra samaj and Chairman of Varachha Cooperative Bank Limited) and Arjan Dholakia(Director SRK), reported deshgujarat.com Jan 1. And he delivered an address on ‘Ethical Business’. Earlier, on Jan 1, the Dalai Lama addressed more than 4000 mostly young people at the Veer Narmad South Gujarat University Convention Hall. The interaction was jointly organized by the SVNIT, Auro University and Sarvajanik Education Society. The Dalai Lama also met with some 750 Tibetans who visit Surat at this time of the year to eke out their living selling winter clothing in makeshift markets. This was the Dalai Lama first visit to Surat, known globally for its diamond processing industry.